The Open Education Licensing Project was a joint research and development project undertaken by Swinburne University of Technology and the University of Tasmania in 2015/16. In 2015 the project team surveyed and collected information from managers, educators and information professionals in Australian universities about their understanding and experiences with licensing issues for open online education. 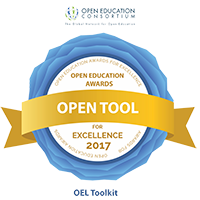 On the basis of information collected, in 2016 the team developed the OEL Toolkit to support the use and development of Open Educational Resources (OER) in the Australian higher education sector. The OEL Toolkit is essentially a decision-tree web application designed support the use, creation, modifying or sharing of Open Educational Resources in the Australian higher education sector. It does this by linking users to information about copyright and licensing based on their responses to a series of questions. At the completion of the questions, users are provided with a customised guidance summary. The information and links in the guidance summary aim to provide the user with specific information relevant to their activities and the basis for further discussion and assistance. Who can use the OEL Toolkit? The OEL Toolkit is openly available and openly licensed. The guidance generated by the OEL Toolkit is of primary relevance to educators and developers working within Australian higher education institutions. The OEL Toolkit web application has been designed with a focus on ease of use. It provides relevant information for users seeking guidance on using, creating, modifying or sharing a specific Open Educational Resource. When entering the OEL Toolkit for the first time, it can be helpful to read through the tips.